Today's high of 93° at Washington ties the annual record of 67 for days with 90° or higher temperatures. The highs of 94° at Richmond and 98° at Raleigh further extend their records to 78 and 91, respectively. Raleigh's high also smashes the old record for the date by 6°. Record daily highs were also set at Washington Dulles (93°, old record 92° in 1970) and Martinsburg WV (95°, old record 94° in 1930). YEAR OF 90 DEGREE OR HIGHER TEMPS...THE MOST ON RECORD. RECORD. SPRING AND SUMMER 2010 WERE BOTH THE WARMEST ON RECORD. 5:30 PM Update: The preliminary high temperature at Washington is 99°, 5° above the old record (1970) and 22° above the climatological average. This is 16 days later than the previous latest date with a temperature of 99° or higher (100° on Sept. 8, 1939). The high of 97° at Dulles also smashes the 1970 record by 5°. Baltimore's high of 95° ties the record, also from 1970. Martinsburg WV's high of 95° is 1° below the 1970 record. 5 PM Update: Washington National is still 97°, Dulles is up another degree to 97° also. 4 PM Update: Washington National has backed off to 97°, Dulles is up to 96°. The latest report from both Culpeper VA and College Park MD is 99°. Dulles is up to 95°. Richmond, Raleigh new records added below. 2 PM Update: The high temperature so far is 93°. Washington Dulles has already broken its daily record with 94°, 2° above the old record set in 1970. The 96° so far at Richmond has broken its previous record of 95° also set in 1970. Richmond records extend back to 1897. Raleigh has reached at least 95°. This breaks the 1945 record by 4°, although Raleigh records extend back only to 1944. At 1 pm today, the temperature at Washington reached 91°, bringing the total number of 90° days for 2010 to 66, one short of the record number in 1980. Richmond (94°) and Raleigh (93°) are continuing to add to their records. 5:30 PM Update: And the preliminary high temperature for today at Washington is 93°. With a morning low of 71°, that's a daily temperature 14° above the climatological average. The 93° at Washington Dulles ties the daily record for the second consecutive day. Baltimore's BWI made it only to 89°. Richmond hit 97°, only 1° below the daily record, and Raleigh's 99° blasted away the previous daily record from 1980 by 5°. The 3 pm temperature at Washington is 92°. Today is the 65th day of 2010 with temperatures of 90° or higher, just 2 days short of the record in 1980. Richmond and Raleigh (currently both 96°) are extending their records by one more day. 5:30 PM Update: The preliminary high temperature is 95°, just 3° below the daily record and 18° above the average for the date. With the low of 67°, the day is 13° above the climatological average. The high at Dulles ties the record set in 1970 and 1980. 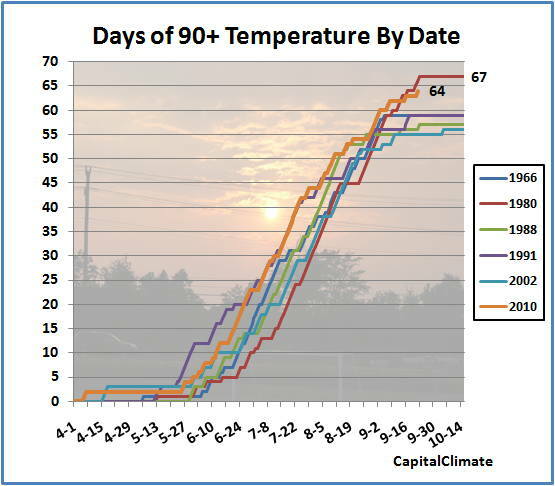 By 3 pm today, the temperature at Washington reached 91°, making this the 64th day of 90° or higher temperatures this year. The high so far today is the 93° reading at 4 pm. Day 64 was achieved 2 days later than in 1980, but that year peaked out at the record annual total of 67 days on September 23. With 90° temperatures expected for the next 2 days, however, this year's heat streak is likely to go at least 1 day later. 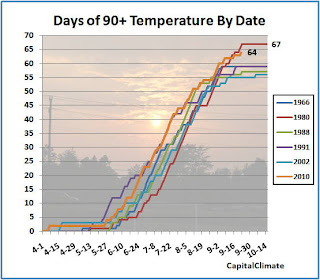 This year has already far exceeded 1980's 90° record in longevity; the first 90° day in 1980 was May 13, but this year it was almost a month earlier, on April 16. Meanwhile, the 94° so far at Richmond and 95° at Raleigh have further extended their already broken records. This is now the 7th day of 90°+ temperatures at Raleigh out of the last 9 and the 13th in September overall. It's the 8th day this month at Richmond. "The combination of the La Nina event, a relatively cold north Pacific, and a record warm north Atlantic are quite bullish for a very warm October, especially across the northeastern quarter of the country" said WSI Chief Meteorologist Dr. Todd Crawford. However, the historically persistent negative phase of the North Atlantic Oscillation and the strength of the North Pacific climate signals suggest that the widespread warmth in October will be short-lived with more widespread cold across the eastern US in November and December. For the October-December period as a whole, we are forecasting 1776 gas-weighted heating degree days, within 1-2% of both last year and the 1971-2000 mean." The latest 90-day outlook for October-December 2010 from NOAA's Climate Prediction Center, shown in the image, calls for more widespread warmth, especially over the central and southwestern portions of the country.